[prMac.com] Davis, California - KEM Ventures, Inc. pioneered the extra-large, super-protective iPad case market with the introduction of Big Grips Frame and Stand in 2011. Today, KEM Ventures, Inc. is launching Big Grips Lift featuring the new super-grip handle with integrated strap loops - making the iPad Air and iPad Air 2 even easier to grab, easier to hold, and easier to carry. Additionally, charging and volume adjustments are even more accessible with redesigned access ports. And, of course, Big Grips Lift works with the original, versatile, and remarkably stable Big Grips Stand. "Since 2011, Big Grips have earned a reputation in homes and schools around the world for providing worry-free drop-proof protection for iPad. Building on that reputation, Big Grips Lift is an easy choice for families and schools looking for seriously fun iPad Air and iPad Air 2 protection." said Kirk Mills, founder and President of KEM Ventures, Inc. "It's difficult to put into words but in your hands, Big Grips Lift feels like an 'ah-ha' moment." Mills continues, "Our core mission is to make using and carrying an iPad effortless and without worry. 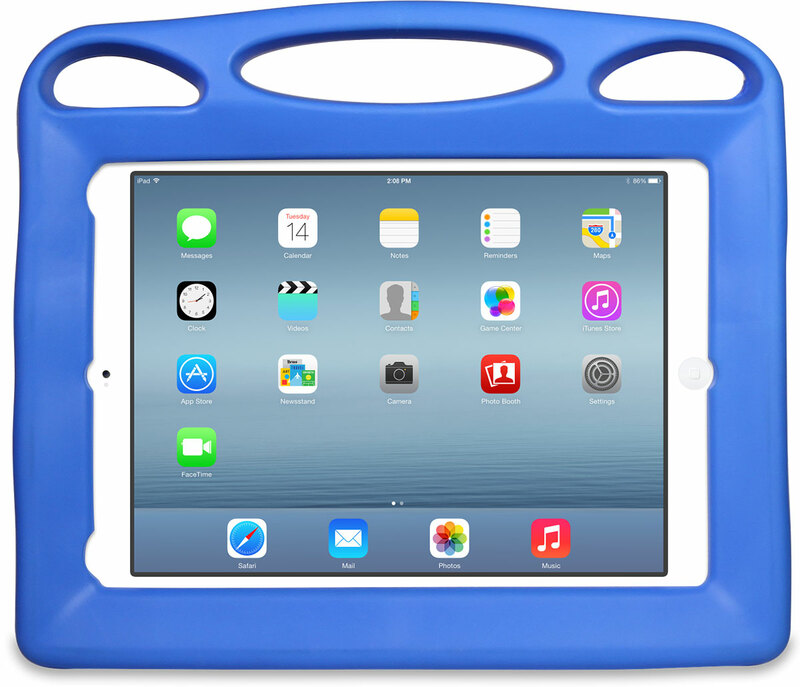 Like all Big Grips products, Big Grips Lift focuses on simplicity and ease of use - making iPad Air and iPad Air 2 even more accessible with a no-nonsense, lightweight, and very protective case. Featuring best in class protection and convenience, with a feel that is comfortably familiar yet unmatched by any other iPad case, Big Grips Lift is simply better." Big Grips Lift and Big Grips Stand are available separately for $39.95 and $19.95 or as a matching set for $49.95 (USD), and are available in black, blue, green, purple, and red. KEM Ventures, Inc., is a family run company based in Davis, California designing fresh, fun and playful accessories for iPad. Copyright (C) 2015 KEM Ventures, Inc. All Rights Reserved. Apple, the Apple logo, iPhone, iPod and iPad are registered trademarks of Apple Inc. in the U.S. and/or other countries.